Exodus 20:13. Thou Shalt Not Kill. For 40 years our country has flouted this, our Lord’s command. On January 19, 2013, Dallas will mark the 40th anniversary of Roe v. Wade, which legalized abortion in America and has led to the death of over 53 million unborn children. Join thousands of faithful at the Dallas March for Life & Rally in remembrance of 40 years in the desert of abortion, to pray for its "exodus" from our community, and to witness to the Promise of Life! 12:00 p.m. Dallas March for Life begins at Cathedral Plaza, proceeds to First Baptist Dallas, where we will join and continue to march together to ecumenical Rally outside the Earle Cabell Federal Courthouse, where Roe v. Wade was first filed in 1970. What started in Dallas must end in Dallas! You have a great opportunity to be a witness for life right now and promote the 2013 Dallas March for Life at the same time! 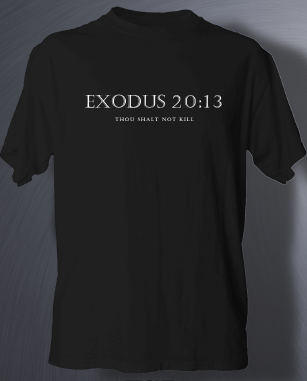 Buy a specially-designed t-shirt, reflecting the theme of this year's march and beyond – Exodus 20:13 Thou Shalt Not Kill. Wear the shirt before, during and after the event to let everyone know where you stand on life! Shirts are available in short sleeve and long sleeve. Click here to order yours today! You can also share Exodus 20:13 with your friends on Facebook.